In 2016, I was able to chase down several tickling daydreams that ran loose in my mind. 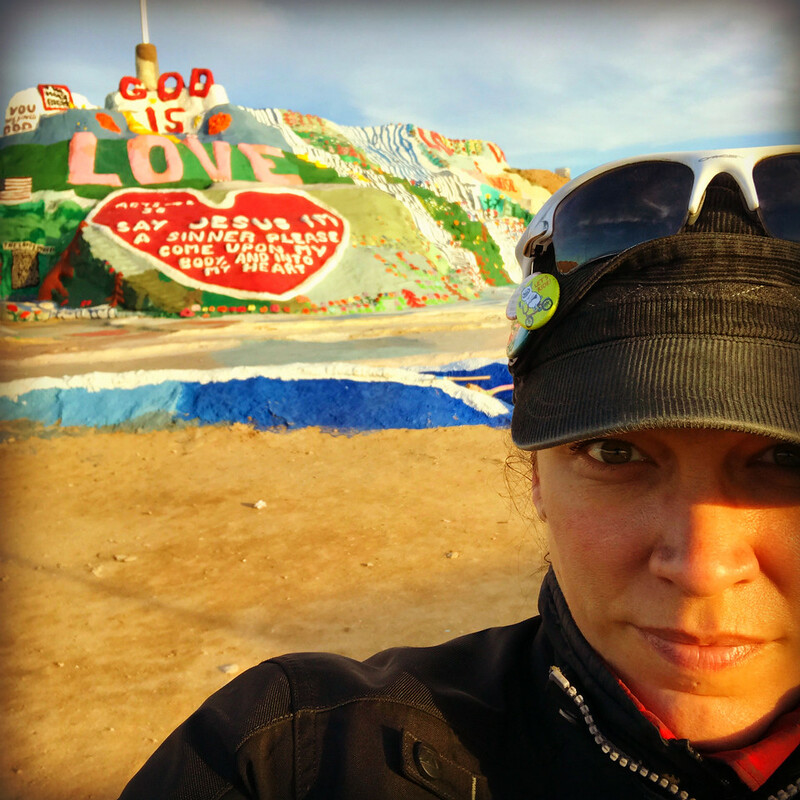 Little did I know when the calendar turned over that not only would I see the Blue Whale of Catoosa in Oklahoma but that I would also find myself in awe at the base of Salvation Mountain in California. The machinations that are at work in our subconscious are mysterious. You think you’re just trying to survive the commute to work but, no – you’re actually planting idea seeds for a road trip to far away places. I go through periods of time where the same ideas will return to me many times. They’re signaling that they need attention, I guess. These ideas become regulars at the bar in my mind. “Oh, hey, West Quoddy Head Lighthouse. Good to see you still coming around.” That’s one that keeps bugging me. “Hi Pedro. Cerveza? Haven’t been to South of the Border since I was a kid!” That’s another. Two rather different stops, rather far from one another. If I had to choose just one of those two places to visit this year, I think that the trip to Maine would win out. I don’t have a concrete reason – just a gut feeling. Part of the daydreaming of visiting a place always has the peripheral stuff you see along the way to get there. I see green in my mind when I think of going to Maine and gray on the way to South of the Border. Abstract perceptions that don’t mean anything. Or do they? With my whims being as mercurial as they are – who knows? Perhaps I’ll see neither of those two places and will see a million others instead. As long as I visit the state of bliss, it’s all good. I’m so knocked out by how many people have sent in their addresses to get a postcard from me. Thank you! 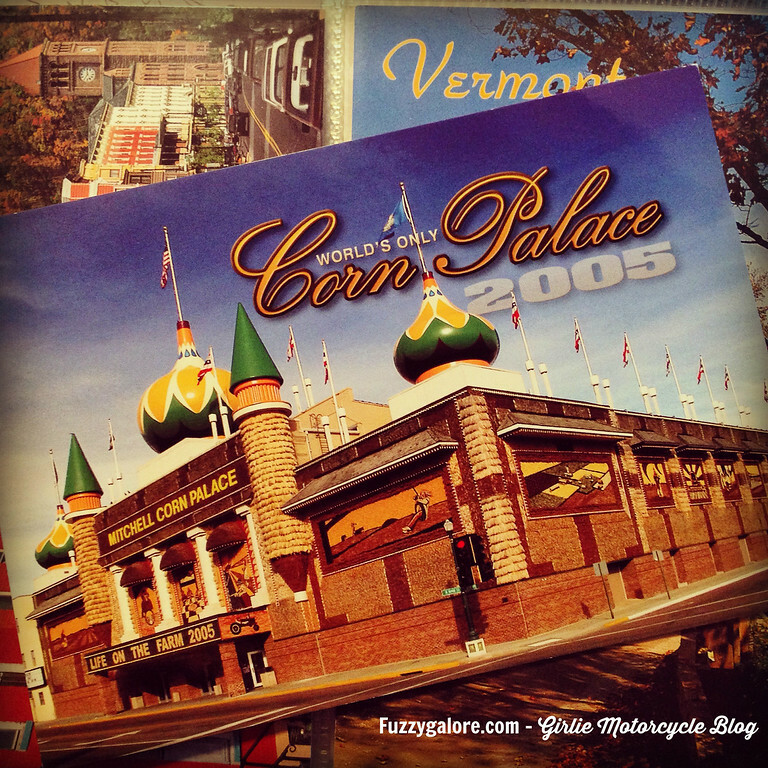 I’d love to get postcards from you, too. 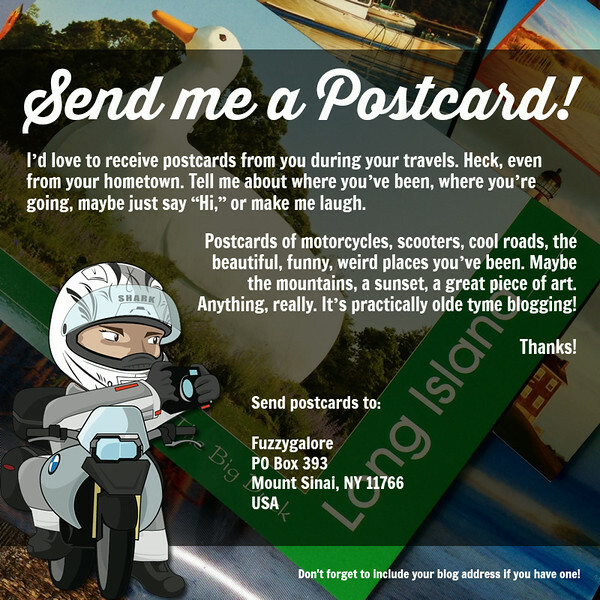 If your pen is burning a hole in your pocket and you want to send me a postcard from your travels, please do! Thanks again, Kathy for the inspiration! And thanks, Ed for the Fuzzy girl image! It came as no surprise that my girl and kindred spirit, Kathy from ToadMama.com loves postcards. They often have the most perfect photographs of wherever you’re visiting. I probably shouldn’t tell you this as it could ruin the reputation of my manly-man Kenny. But…? I will. When Kenny and I first met and we’d travel, even just doing day trips – he would send me postcards from where we’d been with memories of the day or sweet love notes scribbled on the back. He’d drop the postcards in the mail at his house which was just a few miles away. I would then have a lovely memory waiting in my mailbox the next day. I always found it so romantic. Well firstly, you should check out Kathy’s blog. And secondly, and this is a big leap on your part — if you’re feeling daring and want a postcard from overseas, I could be your girl. Since I’m heading off to Italy, France and Switzerland shortly if you’d like to receive a postcard, you could email me a PO Box or mailing address and I’ll send you one. I could tell you that I’m not a creep or anything until I’m blue in the face but I completely understand that sending a stranger a mailing address is a little weird. But, there it is – the offer is on the table. A s k f u z z a t g m a i l with no spaces and the .com is where you can send your address. I’ll do my best to see if I can find cards that are motorcycle-y. And if you’re so inclined, maybe take Kathy up on her blog challenge, too? Thank you to everyone who has sent in their addresses so far! Thanks for the trust and of course thanks for reading. I’ll be in your mailbox soon. Well, not me personally. That would be… something. Ugh. Then the fire department would have to come with the jaws of life to extract me. Wouldn’t that be quite a scene? ::sigh:: No one wants that. 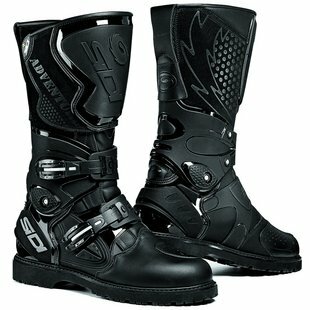 Post a picture of your favorite non-motorcycle/scooter shoes & one of your motorcycle/scooter boots/shoes. For many women this is like saying “Post a picture of your favorite child!” And like children, if you have only one maybe that would be easy. But if you’ve got like over a 100 different ones to choose from… eh, no so much. That’s 100 different pairs of shoes, not children. If it were children you should seriously invest in a tv or a motorcycle or something else to do with your time. And also your uterus would probably fall out. It was impossible for me zero in and pick a single favorite pair of shoes. I really don’t have one. 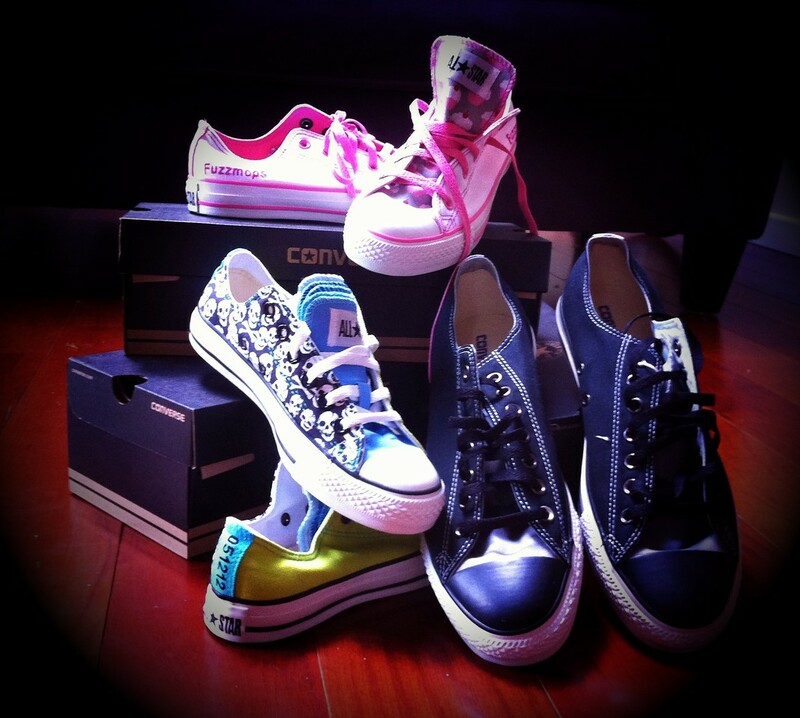 So – instead I opted to pick my favorite brand of sneakers. The beautifully classic – Converse Chuck Taylor. 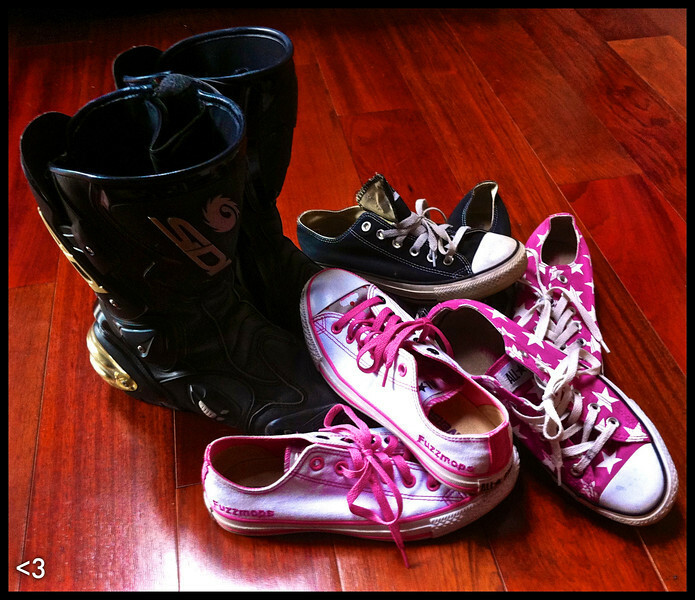 The white Chucks were the shoes I got married in back in May. Being that weddings are a time of happiness, it seemed like being too serious would be a travesty. Instead we 3, The Fuzzmops as our little family is called, opted for some custom Chucks featuring our name and the date of the wedding embroidered on ’em – 051212. I guess you could say I am brand loyal when it comes to shoes and motorcycle boots. Love my Converse and of course love my Sidis. 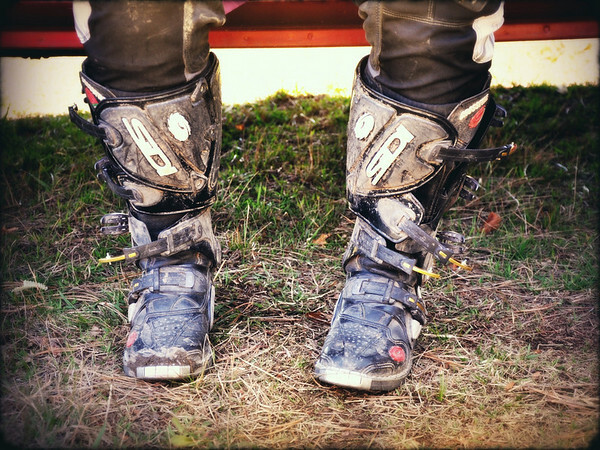 When it came to buying my dirt boots I went right back to my go-to brand and opted for the Crossfires. A choice I have been extremely satisfied with. My Vertigo Rain street boots are on their last legs. The soles are nearly walked off and paper thin, the heels are little more than just a suggestion and the toes are ground out a bit. What was once water resistant is no longer. I’ve been hemming and hawing over biting the bullet and getting a pair of GORE-TEX Sidi Adventure boots to replace the Vertigos. They look like they’d give me a wee lift that I could really use on the Tiger and keep my piggies dry to boot. See what I did there? I Spy: Honda CB350 Motorcycle – Daily Rider?